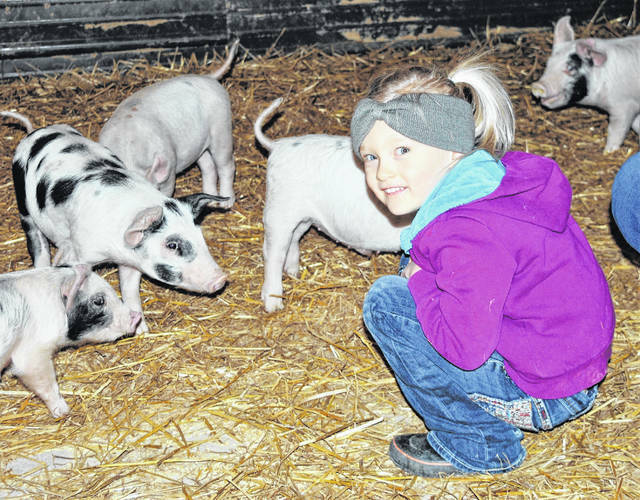 FACT promotes humane farming in the U.S.
One of the chores assigned to 4-year-old Eliza Stacy is to make sure the pigs are kept happy in the barn or out in the field at Grass Powered Poultry & Meats east of Hillsboro. A Hillsboro farm recently received a Fund-a-Farmer Grant from Food Animal Concerns Trust (FACT), a national nonprofit organization that promotes the safe and humane production of meat, milk and eggs. Grass Powered Poultry & Meats, located on Carper Lane east of Hillsboro near Boston, was one of three Ohio farms to receive the FACT grant money, which is designed to expand humane farming by expanding the animals’ access to well-managed pasture, according to FACT Humane Farming Director Larissa McKenna. McKenna said that this year alone FACT awarded more than $94,000 to independent family farm operations like Grass Powered Poultry & Meats to help them achieve a high level of animal welfare. The farm is owned and operated by Dana Workman-Stacey and her husband Jesse, and Dana said her farm will use the grant money to build a high tensile perimeter fence to raise beef cattle, hogs, broilers, turkeys and laying hens. Though committed to the longterm success of its farming operation, the couple still has full-time jobs off the farm with Dana employed at Farm Credit Mid-America and Jesse working for the Highland County Soil & Water Conservation District. The concept they embrace, that of raising animals exclusively on grass and pasture, isn’t new, but is a different direction when compared with the large corporate business model that’s been adopted by most modern farmers. She described farming as a lifestyle that really agrees with her family, where six months ago baby Brynn joined her 4-year old big sister Eliza, who enjoys visiting with the baby pigs and was equally excited about Saturday’s arrival of baby chicks. The biggest challenge, she said, was starting from scratch using a farming business model that isn’t conventionally done anymore. What brings her the most satisfaction, though, is being able to work side-by-side with her family and hearing from people that tell her how their products have positively impacted their lives. People that are interested in Grass Powered Poultry & Meats products can get them directly from the farm through the Chillicothe Farmers Market and through Walker’s Farm-to-Fork, a local food truck operation.